Please join Eliza Bryant Village as we celebrate 123 years of providing quality services to seniors and their caregivers. 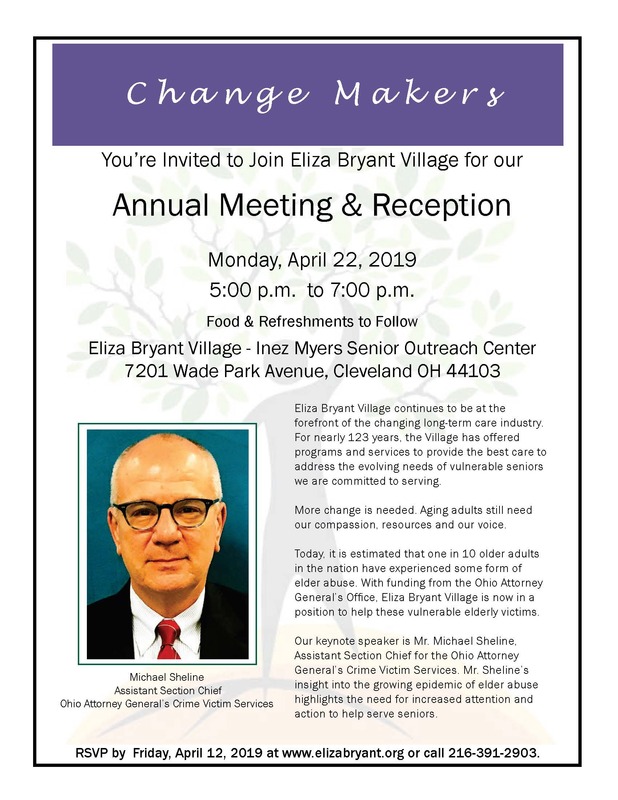 Our Annual Meeting & Reception will be held on Monday, April 22, 2019 from 5:00 p.m. to 7:00 p.m. at Eliza Bryant Village, Inez Myers Senior Outreach Center, 7201 Wade Park Avenue, Cleveland, Ohio 44103. Eliza Bryant Village continues to be at the forefront of the changing long-term care industry. For nearly 123 years, the Village has offered programs and services to provide the best care to address the evolving needs of vulnerable seniors we are committed to serving. More change is needed. Aging adults still need our compassion, resources and our voice. Today, it is estimated that one in 10 older adults in the nation has experienced some form of elder abuse. With funding from the Ohio Attorney General’s Office, Eliza Bryant Village is now in a position to help these vulnerable elderly victims. Our keynote speaker is Mr. Michael Sheline, Assistant Section Chief for the Ohio Attorney General’s Crime Victim Services. Mr. Sheline’s insight into the growing epidemic of elder abuse highlights the need for increased attention and action to help serve seniors. Copyright © 2015 Eliza Bryant Village. All Rights Reserved.